Having arrived safely in Nuuk, Dunbar and I were counting on a relatively uneventful 1800 miles passage to the Azores. To finish our sojourn in Greenland on a high, we decided to make a detour to visit the spectacular Prince Christian Sound. Instead of a high, we ended up with a low, a real low. 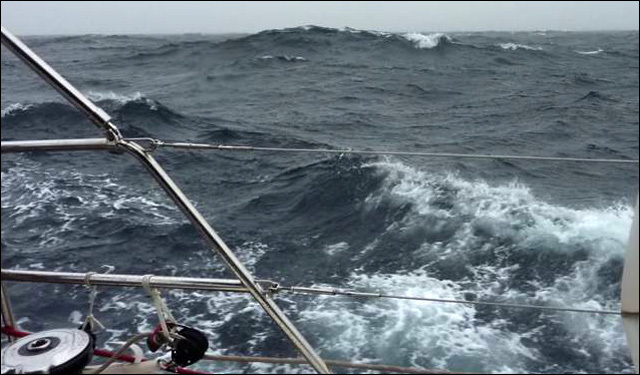 Halfway to our hoped-for destination, the wind changed direction and was blowing strongly from southeast, which was exactly where we intended to sail… so we had no choice but abandon our plan and tack offshore. These are not the photos I promised when I concluded my previous report, but they are the best I can do to illustrate this update on Aventura’s southbound passage. 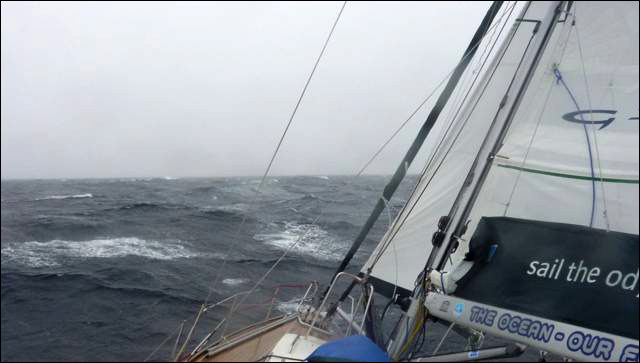 By the following morning the wind was blowing at over 30 knots, it was misty, damp, cold; in other words a typical summer day in the North Atlantic. It reminded me of fellow sailor Jack London’s remark: the worst winter I ever spent was summer in San Francisco. 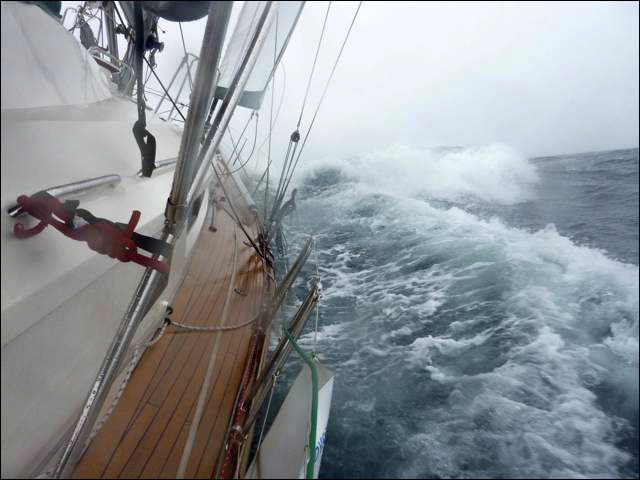 Being well reefed down, Aventura was holding her course and, bearing in mind the conditions outside, was quite comfortable. 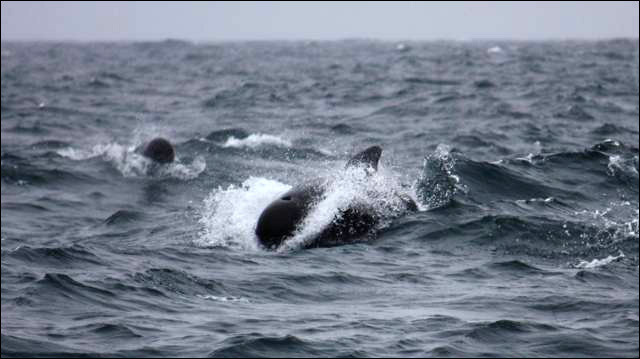 As the wind started going down, we were suddenly surrounded by a large number of pilot whales and dolphins surfacing and diving rapidly, engaged in a feeding frenzy. 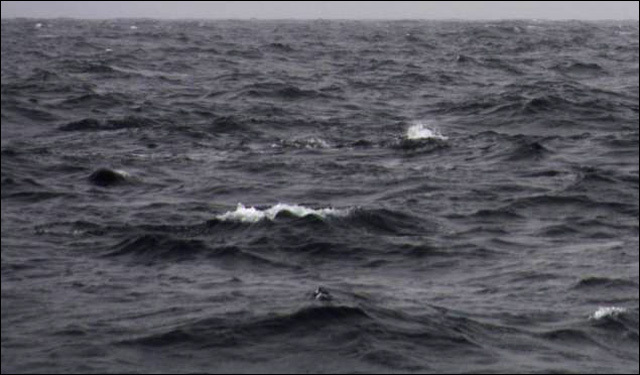 A snapshot of a surfacing pilot whale to send us on our way, bound for the Azores, now some 1400 miles away.